WASHINGTON — President Donald Trump celebrated improvements to the mobile system veterans can use to access health care Thursday, touting an "historic breakthrough" in Department of Veterans Affairs technology that makes it easier for patients to schedule and receive care remotely. The new tools expand the VA's existing 'Telehealth Services' with a new application that lets veterans schedule appointments from their mobile phones (Veteran Appointment Request, or VAR) and VA Video Connect, which connects veterans with health specialists. From the White House Roosevelt Room, Trump video-conferenced with a Coast Guard veteran in Oregon undergoing examinations for his skin. "I hope your skin is going to be in perfect shape!" Trump told the veteran during the demonstration. "Looked pretty good to me. What do I know?" "Please make sure his skin is perfect, okay? Perfect," Trump told the doctors. The president was also shown a new doctor's bag available to veterans — one he may recognize because it's similar to the one used on Air Force One. 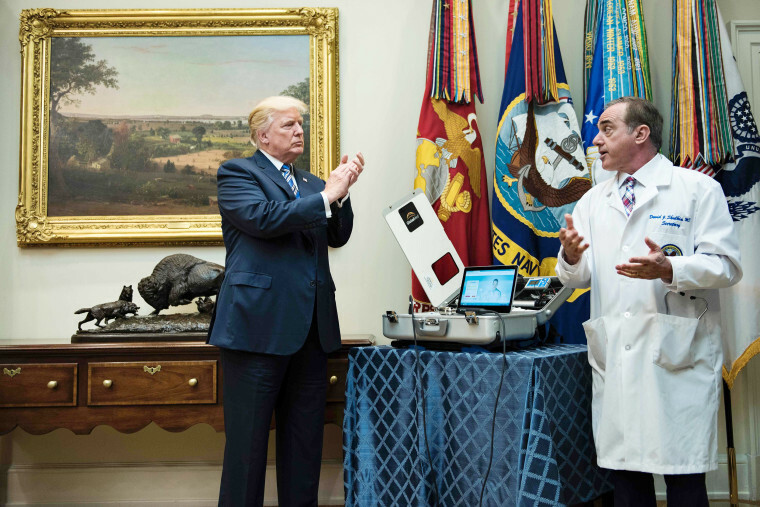 That veterans would have access to the same technology as the president is "the way it should be," Veterans Affairs Secretary David Shulkin said. "This is all part of our modernizing the VA," Shulkin told reporters before the event, calling it "another step that we're taking to make sure that our veterans have the very best care." Last year alone, 700,000 veterans received care through telehealth services, Shulkin said. Shulkin pointed to the upsides in this advancement, drawing attention to how telehealth options can aide in treating mental health, particularly in rural areas that have fewer mental health professionals. The VA currently spends about $1 billion per year on telehealth services, a budget Secretary Shulkin says they'll continue to put toward taking the software rollout and improvement nationwide. But part of making this system accessible everywhere means widespread, national access to broadband, a persistent problem in some rural areas of the United States. "Broadband capability access in rural areas is a big concern to us," Shulkin said in a call with reporters before the event. Reed Cordish with the White House's Office of American Innovation said rural connectivity is a "critical priority" for both the Trump administration and Congressional leadership. In order to address the problem, Cordish said, "we are making it a priority item...within our infrastructure package that will be transmitted to Congress later this year."